I would like to express my sympathy to you in your loss. May Mary's soul rest in peace. It is with great sadness that we were informed of Mary's passing.There are many fond memories to cherish.Life is a journey and while we know that the journey comes to an end it is still difficult to accept and understand.Please accept our heartfelt sympathy and God's blessings at this time. Condolence: Our deepest sympathies to Brian and the entire family. Condolence: My sincere condolences and prayers go out to Brain and family during this difficult time. Condolence: Mary was a true warrior in defense of emergency services and how vital they are in todays world. 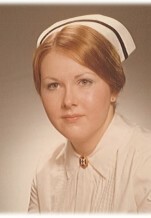 She was extremely knowledgeable and smart in her profession and gave wonderful healthcare to her patients. Although Mary was unable to nurse for many years due to her illness she she still gave a strong opinion on what needed to be changed to make it even more efficient. Condolence: Dear Brian and family, I was so sorry to hear this sad news. As you go through the difficult days ahead, I hope memories of happy times together bring you comfort. Sending hugs your way.